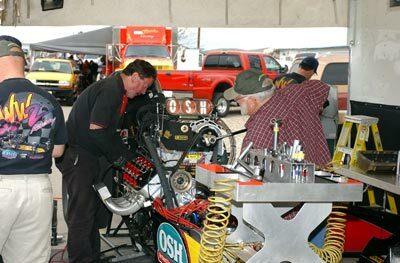 Motorsports in general and drag racing in particular is like any other major sport - its very competitive and the sheer number of class competitors makes it almost impossible to get "on top". 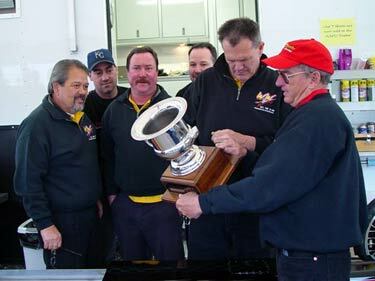 Over the last six seasons, Jim Murphy and the OSH-WW2 Racing team, like a surfer on a huge wave, have ridden the peek and and wiped out in the curl. For the last six races they've back on the peek and are still riding the curl. 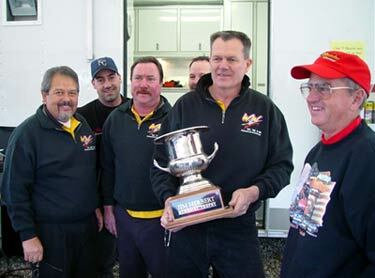 After winning the 2002 Goodguys World Finals last November, and the 2003 March Meet at Bakersfield, Murphy and crew traveled to Boise, Idaho for the "Ignitor Open" - the first major race of the season at Firebird Raceway. 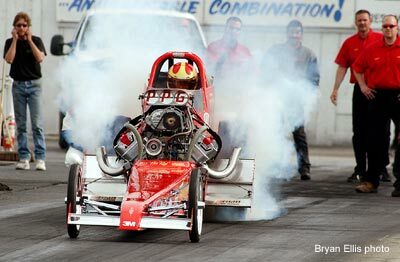 Amid inclement weather conditions, they qualified # 4 with an easy 6.24. 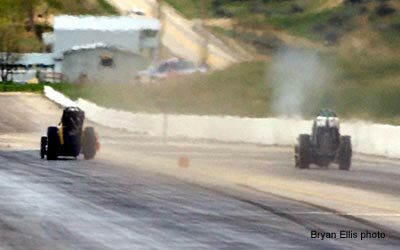 Sunday eliminations saw ideal racing air, extraordinary track conditions and some unwelcome rain. With temperatures in the mid-50s and overcast skies, the fans would see Murphy run the quickest NTF time in track history. But that didn't come until round two. 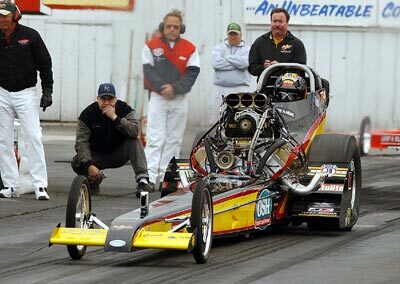 Round one had Jim Murphy defeating Scott Mason with a slowing 6.07 @ 191.08 to a game 6.17 @ 222.44. 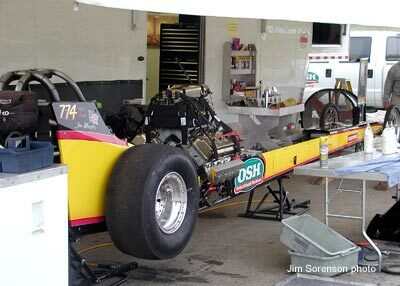 Tim Beebe had the OSH car tuned tight, netting a stunning 3.91 @ 204.82 at the eighth mile. 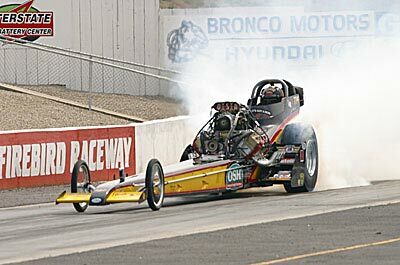 Unfortunately the car drifted to the centerline at the 1,000 mark and Murphy had to shut it off early (below). 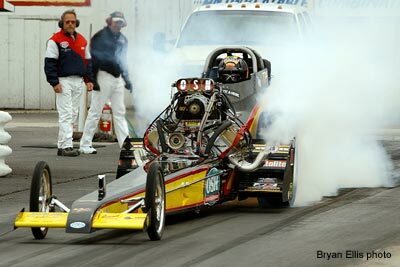 In the semi-finals, Murphy was paired with #1 qualifier and track record holder, Jack "The Sheriff" Harris. No one will argue that these are two of the sports top teams and alone are worth the price of admission. 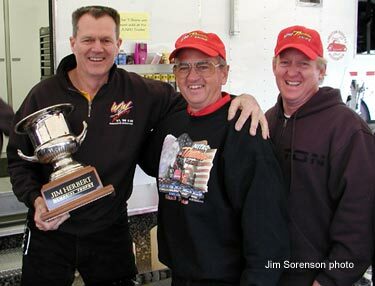 Coming into 2003, Harris has won 3 of the last 4 Nightfire Nationals at Firebird. Murphy knew they couldn't make any mistakes and beat Jack on a track he's basically dominated. What should have been the marquee race of the event turned out to be a stunning one sided victory for Murphy and the OSH-WW2 Racing entry. 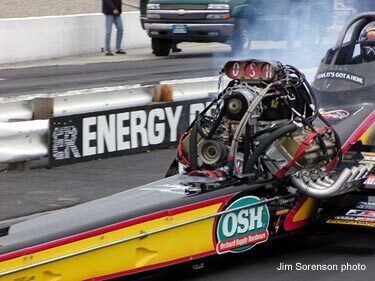 At the green, Harris immediately had problems (below) while the black and yellow OSH fueler marched to a new track record - a stunning 5.862 @ 246.77. Considering the altitude of the Boise track and the fact that the previous record was a 5.93 set by Harris just hours earlier - this run was huge. 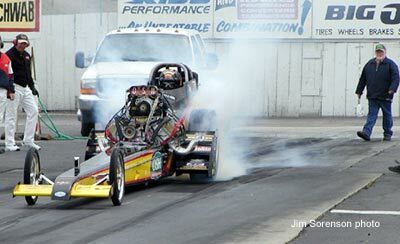 Everyone knew that the Nitro Thunder car was loaded for bear and by the numbers, Murphy was the underdog in this match. What could have been a side-by-side 5.80 race literally went up in smoke for Harris. 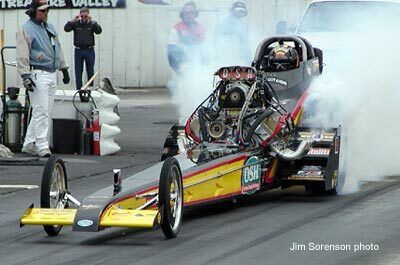 Due to a failure in the fuel system, massive amounts of raw nitro got under the rear tires and caused them to hopelessly spin from the hit of the throttle. You can bet that over the course of the 2003 season these two will lock horns again, and every time it will be a coin toss. 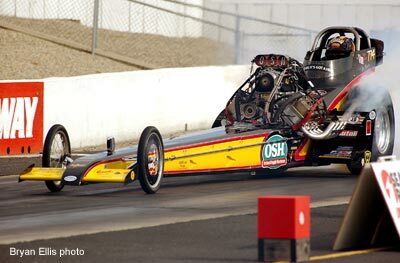 The Top Fuel final was to pit the new track record holder, Jim Murphy against the other semi-final winner, Lee Jennings in his "California Trucker". 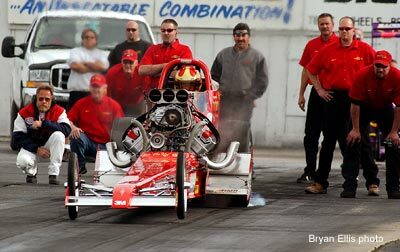 Even though he had run a respectable 6.00 in qualifying, Jennings was coming off a very ugly win in the previous round. While his opponent, Bill Dunlap crossed the center line, Lee go up on two wheels narrowly missing the retaining wall. On the other hand, Murphy was running quicker and faster every round. The numbers suggested that the OSH-WW2 Racing entry would be a strong favorite but rain, instead of horsepower, decided the outcome. 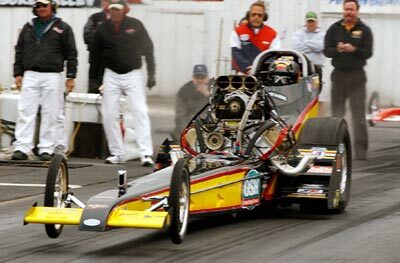 Unable to finish the race, the two teams split the runner-up purse and the AA/FUEL Dragster crown will be decided at the Nightfire Nationals in August. Murphy and Jennings will race for the winners money and bragging rights during the second round of qualifying at that race. Mortal advisories on the track, most racers are the best of friends the rest of the time and have a lot of fun in the process. Here Jack Harris reluctantly turns over the "Jim Herbert Memorial" trophy to Jim Murphy. 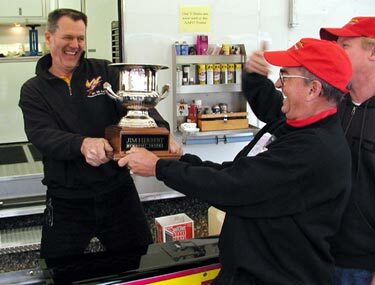 The trophy is awarded to the winner of the Goodguys March Meet and kept by that winner for the following year. Harris had possession of this prize for the two previous years but had to turn it back over to Murphy as the winner of the 2003 event. Murphy had won the trophy the two years prior to Harris' back-to-back wins. This was the kind of weekend the crew loves. 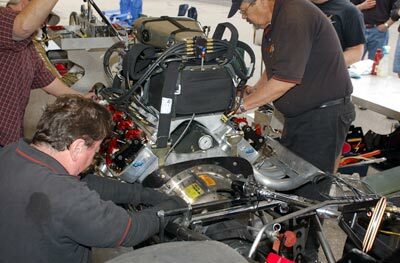 Virtually no parts breakage which means routine maintenance and time to study the tune-up. 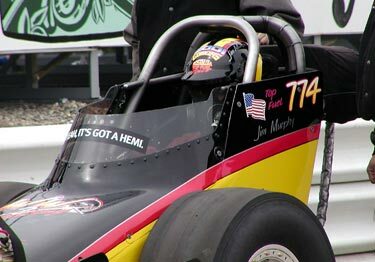 Designated driver (back to the pits), Dave Thornhill and the new Dodge "Yea, it's a hemi" ad campaign sticker. These were all over the pits of Boise. Yep, it pays to advertise. 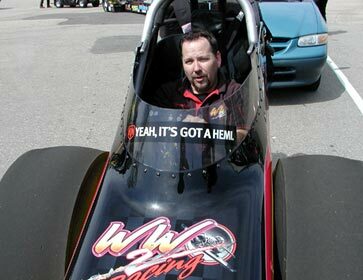 And you can bet the OSH-WW2 car is a HEMI! Good race - happy crew. 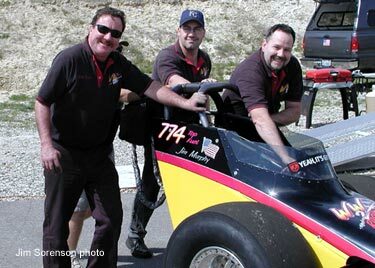 Barry Byrne, Jeff Shamrock and Dave Thornhill.